Most patients with an abdominal aortic aneurysm do not have any symptoms. An abdominal aortic aneurysm may be diagnosed by a screening ultrasound test (in patients 65-74 years of age with a history of smoking) or on imaging studies performed for another reason. Uncommonly, patients presenting with a large abdominal aortic aneurysm may experience lower back pain or abdominal pain. Diagnosis requires an ultrasound or a CT scan and regular imaging studies (CT scan or ultrasound) every 6 months or one year to monitor for growth. About 3 out of 4 abdominal aortic aneurysms don't cause symptoms. An aneurysm may be found by X-ray, computed tomography (CT or CAT) scan, or magnetic resonance imaging (MRI) that was done for other reasons. Since abdominal aneurysm may not have symptoms, it's called the "silent killer" because it may rupture before being diagnosed. Pain is the most common symptom of an abdominal aortic aneurysm. The pain associated with an abdominal aortic aneurysm may be located in the abdomen, chest, lower back, or groin area. The pain may be severe or dull. Sudden, severe pain in the back or abdomen may mean the aneurysm is about to rupture. This is a life-threatening medical emergency. The symptoms of an abdominal aortic aneurysm may look like other medical conditions or problems. Always see your doctor for a diagnosis. Abdominal aortic aneurysm open repair. A large incision is made in the abdomen to let the surgeon see and repair the abdominal aorta aneurysm. A mesh, metal coil-like tube called a stent or graft may be used. 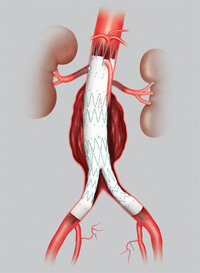 This graft is sewn to the aorta, connecting one end of the aorta at the site of the aneurysm to the other end. The open repair is the surgical standard for an abdominal aortic aneurysm. Endovascular aneurysm repair (EVAR). EVAR requires only small incisions in the groin. Using X-ray guidance and specially-designed instruments, the surgeon can repair the aneurysm by inserting the stent or graft inside the aorta. The graft material may cover the stent. The stent helps hold the graft open and in place. A small aneurysm or one that doesn't cause symptoms may not require surgery until it reaches a certain size or is rapidly increasing in size over a short period of time. Your doctor may recommend "watchful waiting." This may include an ultrasound, duplex scan, or CT scan every 6 months to closely monitor the aneurysm, and blood pressure medicine may be used to control high blood pressure. If the aneurysm is causing symptoms or is large, your doctor may recommend surgery. Not all patients can tolerate the risk of open surgery, so endovascular repair is a great option. Unfortunately, not all patients have the anatomy to qualify for endovascular repair. Consult your vascular surgeon about which technique is best for you. Open aneurysm repair: A large incision is made in the abdomen to repair the aneurysm. Another incision is made in the aorta for the length of the aneurysm. A cylinder called a graft is used for the repair. Grafts are made of polyester fabric or polytetrafluoroethylene (PTFE, nontextile synthetic graft). This graft is sewn to the aorta, from just above the aneurysm site to just below it. The artery walls are then sewn over the graft. An aortic dissection starts with a tear in the inner layer of the aortic wall of the thoracic aorta. The aortic wall is made up of 3 layers of tissue. When a tear occurs in the innermost layer of the aortic wall, blood is then channeled into the wall of the aorta separating the layers of tissues. This generates a weakening in the aortic wall with a potential for rupture. Aortic dissection can be a life-threatening emergency. The most commonly reported symptom of an aortic dissection is sudden, severe, constant chest or upper back pain, sometimes described as "ripping" or "tearing." The pain may move from one place to another.